Notice the difference in the color and size of the eggs between the top two photos and the third. The smaller green eggs are newer, having been deposited relatively recently. The larger brown eggs (bottom) are older and will be shed sooner. In fact, the animal in the bottom photo looks like she has already shed a batch of eggs. 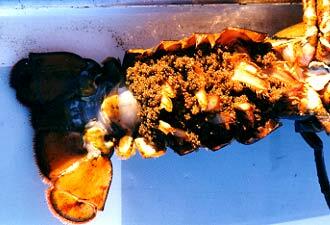 Lobster do not shed their eggs all at once, but rather in batches. An unnotched egger. 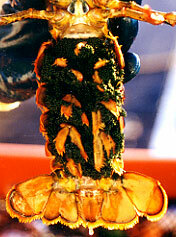 This lobster will be notched and released. This female has been notched before (second flipper from left). If the notch looks like it has grown out too much, the captain will re-notch the animal before releasing it. 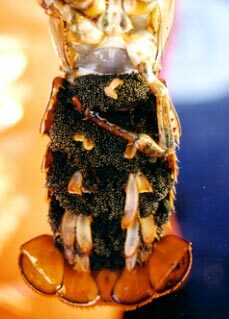 A closer look at the eggs of another female.